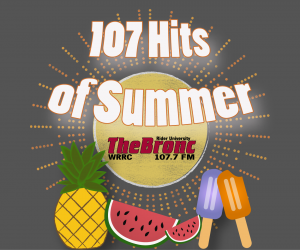 107.7 The Bronc is relieving the hits of summers past and present, with the 107 Hits of Summer! From Friday, May 25 through Monday, September 3, listen to your favorite summer hits twice every hour, starting with the ’80s. From hit rock songs like “Californication” by Red Hot Chili Peppers to Guns n’ Roses’ “Paradise City,” to hip-hop classics like “It Was A Good Day” by Ice Cube and Sir Mix-A-Lot’s “Baby Got Back,” The Bronc’s wide array of spectacular jams are enough to make any summer event feel groovy. You can listen to The Bronc’s 107 Hits of Summer through our mobile apps. Simply download the free WRRC app from Google Play or the Apple iTunes store to listen to The Bronc on the go. Access 1077TheBronc.com Listen Live Box via or your PC or laptop.